I enjoyed the voice of her international life journey. Living and cooking in Berlin, Italy, Paris and New York, she shares recipes at the end of each chapter. 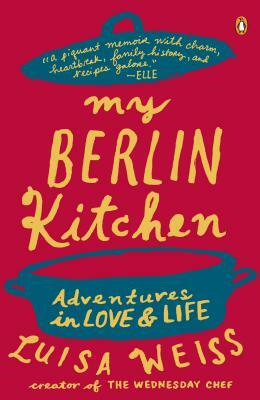 There is an emphasis on German cooking and her time in Berlin which I fould fascinating, having visited there last year. It takes courage to turn your life upside down, especially when everyone is telling you how lucky you are. But sometimes what seems right can feel deeply wrong. My Berlin Kitchen tells the story of how one thoroughly confused, kitchen-mad romantic found her way to a new life, a new man, and a new home in Berlin. Luisa Weiss was working in New York and about to get engaged when she decided to bake, roast, and stew her way through her huge collection of recipes. She started a blog to document her adventures. The Wednesday Chef was an instant sensation, bewitching readers who fell in love with Luisa and cheered her growing confidence. My Berlin Kitchen chronicles Luisa’s decision to give up the life she had built and move across the ocean in search of happiness—only to find love waiting where she least expected it. Luisa Weiss was born in West Berlin and spent her childhood shuttling back and forth between her Italian mother in Berlin and her American father in Boston. She is also the author of the cookbook Classic German Baking. She now lives in Berlin with her husband and son.